1990 – LOKO TRANS commences its activities by providing rail transport using the railway sidings of ZZN Ivančice. 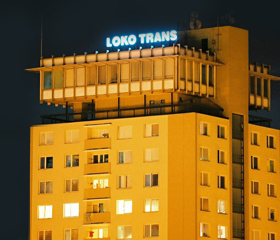 1994 – The company expands its business and transforms to LOKO TRANS s.r.o. 1997 – The company enters the Slovak market and subsequently founds a sister company, LOKO TRANS Slovakia s.r.o., which served as the service and repair base, including mobile service for railway technology. Both companies are property-related entities. 2009 – LOKO TRANS s.r.o. establishes its own repair base for locomotives in Střelice near Brno. The repair centres LOKO TRANS Slovakia s.r.o. in Dubnica nad Váhom and Šurany continue to be used for repairs of rail cars. 2012 – LOKO TRANS purchases 51% of the shares in the company Lokomont.